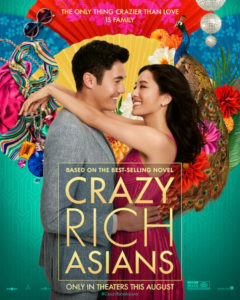 Director Jon M. Chu’s adaptation of Kevin Kwan’s book stands on its own, by adding key scenes, tweaking character’s roles while at the same time astonishingly bringing the over-the-top opulence to life. Unquestionably, Hollywood has been disconcertingly negligent by not producing films centering on Asian culture, can you believe its been 25 years since Amy Tan’s “Joy Luck Club” played on the big screen? Not to mention 13 years since “Memoirs of a Geisha.” What’s exhilarating aside from Asian ethnicity—“Crazy Rich Asians” is one of the best rom-coms certainly of the summer—and perhaps of the last decade. 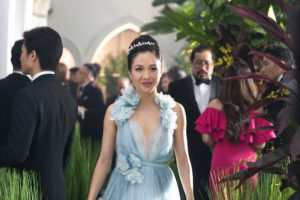 Similar to a modern-day Cinderella fairy tale, the sweet, naïve Rachel Chu (Constance Wu), a New York University economics professor is unknowingly dating a ‘crazy rich’ Asian guy, Nick Young (Henry Golding), who in theory is Singapore’s equivalent to London’s “Prince Harry.” When Nick invites Rachel to attend the wedding of his best friend in Singapore, he doesn’t divulge his family’s wealth status—however, red flags are raised when Rachel’s shown to her first class private cabin seat. Upon arrival in Singapore, Rachael is whisked to a multitude of lavish parties meeting Nick’s inquisitive friends and prying family—Rachael wasn’t prepared to be shoved front and center into the spotlight. Quickly she found a confidante in the bubbly and vivacious Peik Lin (Awkwafina), an unforgettable scene-stealing force of nature. Peik informs Rachel of the Young clan’s heritage and other families that left China generations ago to settle on a small island nation and thus transforming it into a cosmopolitan paradise. These billionaire clans scoff at mainland China’s newly attained wealth—while reserving distinct contempt for Americans, with their focus on self over family loyalty. Rachel, an Asian American career woman, is seen as a gold-digger, an outsider, who will never fit into Nick’s world. Her polite but cold welcome from Eleanor, Nick’s mother (a compelling Michelle Yeoh) whom we soon find out is determined to prevent her son from marrying a person that she feels is incompetent in handling the Young dynasty. As important as her opinions may be, the final judgment is reserved for Nick’s grandmother, the matriarch played by the veteran Chinese American actress Lisa Lu (“The Joy Luck Club”1993). Rachel’s key ally within Nick’s family, is his cousin, the glamorous Astrid (Gemma Chan), offers solace when she’s around, which isn’t much as she enjoys flying to Paris to frequent the couture houses of Dior and Chanel. The fun-loving Oliver (Nico Santos, supplies a dizzying stream of gossip, followed by encouragement and fashion tips. Adding a comedic tone is Peik’s father is none other than the highly recognizable and hysterical actor/real-life doctor, Ken Jeong, from “Knock-up”(2007) and “The Hangover”(2009). He helps Rachel to “fit-in” giving instructions on how to survive the wedding and the endless planned lavish events. Each invitation requires detailed planning as in wardrobe, protocol, and expectations. Luckily, Rachel has help with all of these details except the fact that she, as an outsider born and raised in America will never truly be accepted as an equal. In an unconventional rom-com twist—as Nick falls deeper in love with Rachel during his homecoming—Rachel falls deeper into despair followed by utter confusion. As Rachel begins to realize her back is up against the wall a marvelous occurrence happens—she unwaveringly takes things into her own hands to prove her worth. Although very different from the book’s ending—here we are treated to a strong feminine-based scene that is marvelously captured by cinematographer Vanja Cernjul—with stellar editing to match. The layered scene will forever be one of my favorites, as a cat and mouse scene in which the tables turn. The Bottom line: Chu’s excellent film has so much going for it in which he can take credit for— rewriting key scenes from the book, along with the addition of new material enhance the film’s quality and overall tone. Rachel’s character rises to the top through great direction and careful rewrites. Truly a gem of a film that has something to say to all generations!